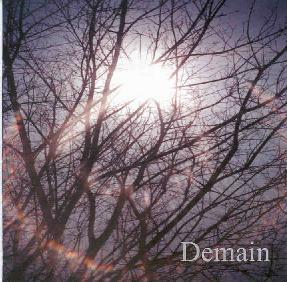 Demain - "A Silber Records Sampler"
Demain is a compilation of samples from several artists on the Silber Records label. The main theme across most of the bands is ambient music that combines, to varying degrees, noise and melodic atmospherics. The lineup includes Origami Arkita, Peter Aldrich, Small Life Form, My Glass Beside Yours, Remora, Clang Quartet, burMonter, Vlor, Fade, and Still. Among the standouts for this listener is My Glass Beside Yours who contribute two tracks. On one a guitar plays a lo-fi melody against textured noise patterns. A second guitar creates wonderfully spacey sonic tapestries that contrast but cooperate very nicely with the melody. The music is cosmically atmospheric and develops very nicely against it's basic theme. The other track features strumming guitars and what sounds like scratchy violins. Strangely soothing. I'll call it meditational dissonance. We first reviewed Remora in AI #8. On this sampler Remora plays more atmospheric guitar-scapes, some being noise laden drones and others beautifully melodic. I recall the cassette we reviewed earlier was more noise focused than these tracks but still quite melodic. One of my favorite tracks on this disc is a teamup between Remora and Clang Quartet. The song consists of strummed stringed instruments that sound like Japanese kotos combined with fast-paced percussion that borders on jazz. It's a fascinating combination and I'd love to hear more of their collaborations. Clang Quartet also has a track of their own. It's an engaging blend of percussion driven ambience and noise. A very interesting glom of drones, beats, and even rhythm. Another cool track is by Still, and features an atmospheric acoustic guitar and a howling, but angelic orchestral background. But this is accompanied by oddly syncopated electronic percussion. I'll call it meditational ambience with an edge. (Or maybe New Age in the dark.) Origami Arktika play rumbling ambient noise-scapes that build slowly in volume and intensity. As is always important with me, I like how they keep the varied layers of sound distinct as opposed to meshing it all into a huge wall of noise. Small Life Form play noise explorations that do a good job of combining soothing sounds and a more disturbing drones. And finally, burMonter and Fade contribute actual songs to the compilation. burMonter has a female vocalist I really liked. The music is quite intense with a driving beat, aggressive guitar, and a searing synth line that runs throughout the song. Fade seemed a little out of place, but this is a beautiful light progressive rock tune with a bit of a Renaissance feel. For more information on all the bands featured on Demain you can visit the Silber Media web site. Take some time to explore this site as it has a wealth of info on many cool bands (Swans, Jarboe, etc). Plus there's the QRD zine.